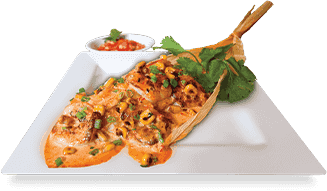 Choice of juicy Arrachera or chicken breast served on a sizzling comal, topped with sautéed mushrooms, poblano strips (rajas) and onions enhanced with fresh lime juice and cilantro. CARNE ASADA MARISOL Not available daily. Check for availability or blackboard specials. Grilled Poblano pepper filled with pulled chicken seasoned with our own secret mix of ingredients and jack cheese. White Confetti rice and our signature Ensalada Tres Marìas 15.99 Try it half cilantro & half chipotle! The Centerpiece landed on our menu back in 1995 as a lettuce-less salad. Today it is as popular as ever! Some of our guests even love it as a meal. You decide! Wedges of tomato, avocado, grilled zucchini, red onions, grilled queso panela and chiles toreados drizzled with our famous cilantro dressing. The perfect addition to any meal. They are served in a hot iron skillet. Pork Tips in our adobo de Chile Chipotle sauce. Spicy! 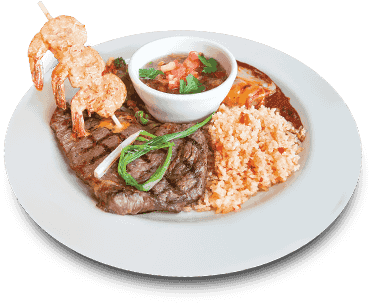 Aldaco's located at the highest point in San Antonio offers patio, private rooms, catering or deliveries for all your entertainment needs. Ask for details! Every day 11:00 a.m. – 3:00 p.m. Except Mother's Day and Father's Day. *Served with rice and frijoles borrachos. For the group that wants it all. Slice of Pastel Tres Leches, 4 Sopapillas, 4 Churros con Cajeta and 1 Flan. (Sorry, no substitutions).